Today we're going to see another example of the Mesomania bias in the Joseph Smith Papers and the ongoing rejection of Letter VII (in this case, even when it is cited). The first edition of the Book of Mormon contained a preface, written by Joseph Smith, that explains the situation with the lost 116 pages. The citation to Letter VII is awesome, but think about this a moment. Why does Joseph Smith use the passive voice only for this clause? And to what plates is he referring? And why is the hill not named, when it is named in Letter VII itself? The only plates Joseph refers to in this preface are the plates of Lehi and the plates of Nephi. He mentions "the Book of Lehi, which was an account abridged from the plates of Lehi, by the hand of Mormon." The Preface follows two reproductions of the Title Page (the Title Page itself, followed by the copyright application that quotes the entire Title Page). The Title Page describes the plates as the two sets of abridgments, plus the sealing by Moroni. But it never mentions the plates of Nephi. Of course, this is the reason the Lord had to tell Joseph about the plates of Nephi in D&C 10; i.e., he didn't have the plates of Nephi when he was in Harmony. Don't forget, he said the Title Page was translated from the last leaf of the plates, and he translated it in Harmony. I think this explains why Joseph used the passive voice in the Preface. He not only didn't have the plates of Nephi when he was in Harmony (because they were not in Moroni's stone box), but he didn't get them himself from the Hill Cumorah. Someone else did, and then brought them to Fayette for Joseph to translate. Consequently, Joseph wrote that "the plates of which hath been spoken," i.e., the plates of Nephi he translated to replace the lost 116 pages, "were found." He didn't find them; someone else did. Hence, he wrote in the passive voice here. With this understanding, note 5 in the JSP is incorrect. JS did not remove the plates of Nephi from the Hill Cumorah. 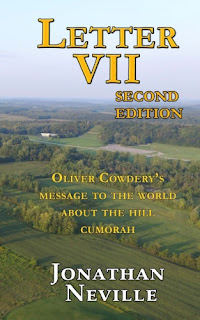 And note 5 is misleading because it refers merely to "a hill" even though Letter VII clearly identifies the hill as the Book of Mormon Cumorah--right there in New York.